GRYPHON, a 7-year old Thoroughbred, had a bone chip removed from his hock. 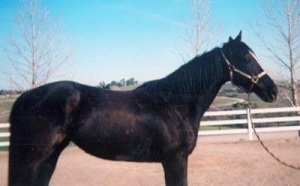 He was 4 years old at the time and had pretty much been sitting in pasture for those first 4 years. He was bought by a young lady who, having not been told he needed to be retired, started jumping him and did so for about 2 years until he started to refuse jumps. To make a long story short, not only did he chip a piece of bone off his hock, she found out that Gryphon had also torn a ligament at the same time making surgery far more extensive than just a routine bone chip removal. So, at the young age of 7, he is fully retired and living here at our sanctuary. He is very sweet and very smart. How truly sad he can no longer be used. He would have been quite the competitor. What a big heart he has for jumping at all for those 2 years. Equines are truly amazing with their big hearts and their ability to bond so strongly that they, even in pain, will do what is asked of them.